By John C. Toman. Posted September 4, 2012, 9:01 PM. A protracted heat wave and active wave of monsoonal moisture combined to make this August the hottest we've recorded at WeatherCurrents. August, 2012 was the hottest on record for each and every station in the WeatherCurrents network, which covers portions of Riverside, San Diego, San Bernardino and Ventura counties. 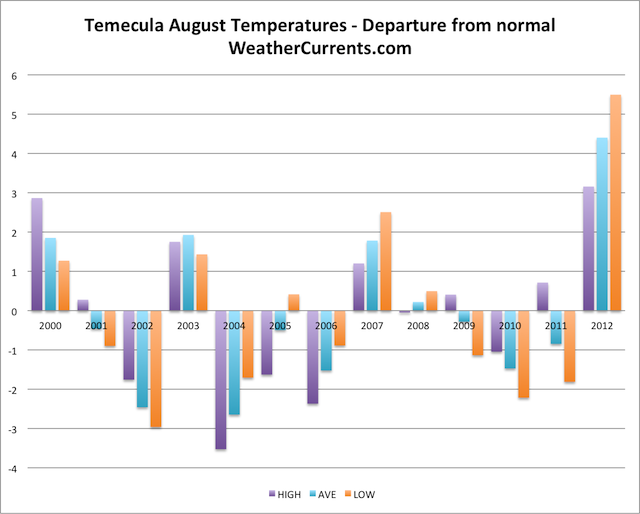 For example, Temecula's climate record dates back to August, 1999, for which only a quarter of that month was recorded. This month's average high of 94.7°F was 3.2°F above normal, and beat 2000's 94.4°F. Lake Elsinore recorded the hottest August for WeatherCurrents' 18 stations, with an average high of 102.8°F, the highest ever recorded at a WeatherCurrents station. That was 3.4°F higher than normal. The other recent warm Augusts on record were 2000, 2003, and 2007. 2002, 2004, 2006 and 2010 featured relatively cool Augusts. In particular, the low temperatures for August were warm. Most communities simply did not cool off the way they usually do in the summer. The warm nights reflect the increased humidity and cloudiness from waves of monsoonal moisture. Temecula's August average low was 67.5°F, by far the warmest for that station, beating 2007's 64.5°F, and 5.5°F above normal. These patterns were repeated for community after community in the WeatherCurrents network, as demonstrated by the graphs below. Locations with records dating back to 2006 are listed. August temperatures in Temecula (records date to 2000). © 2012 WeatherCurrents. 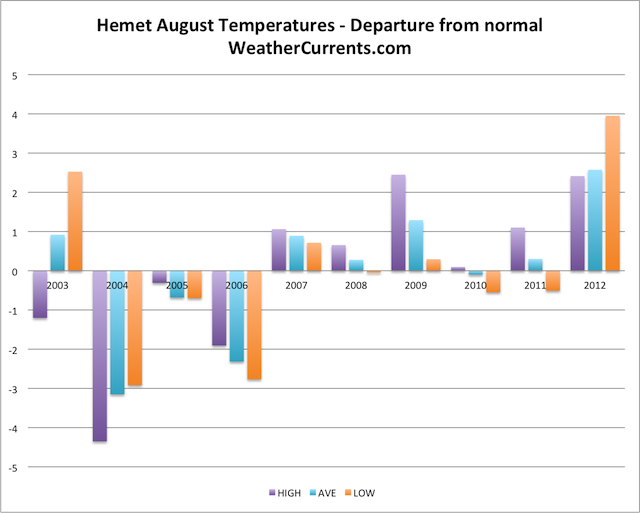 August temperatures in Hemet (records date to 2003). © 2012 WeatherCurrents. 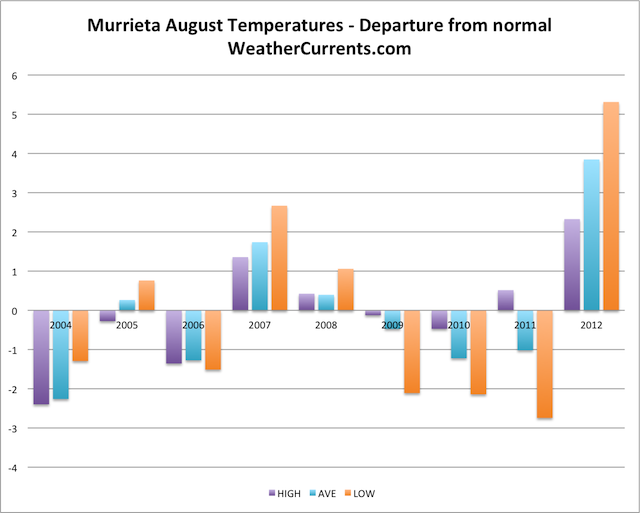 August temperatures in Murrieta (records date to 2004). © 2012 WeatherCurrents. 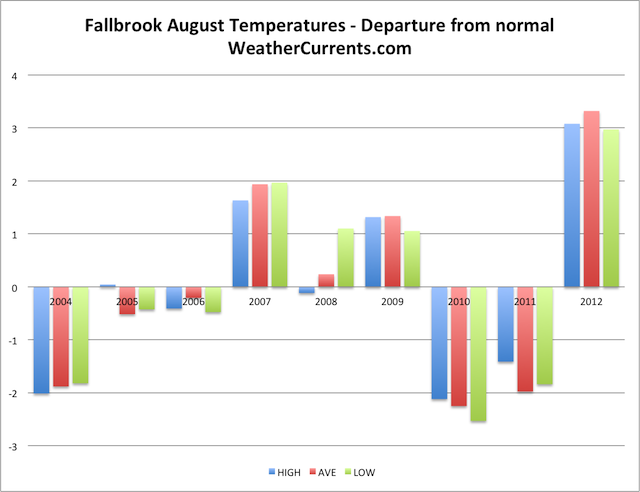 August temperatures in Fallbrook (records date to 2004). © 2012 WeatherCurrents. 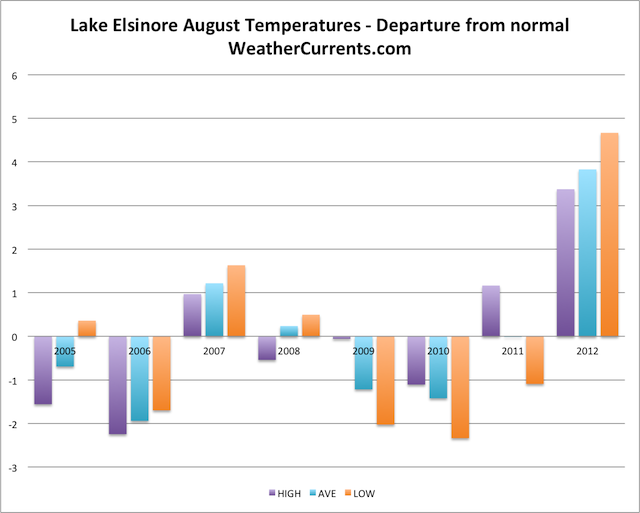 August temperatures in Lake Elsinore (records date to 2005). © 2012 WeatherCurrents. 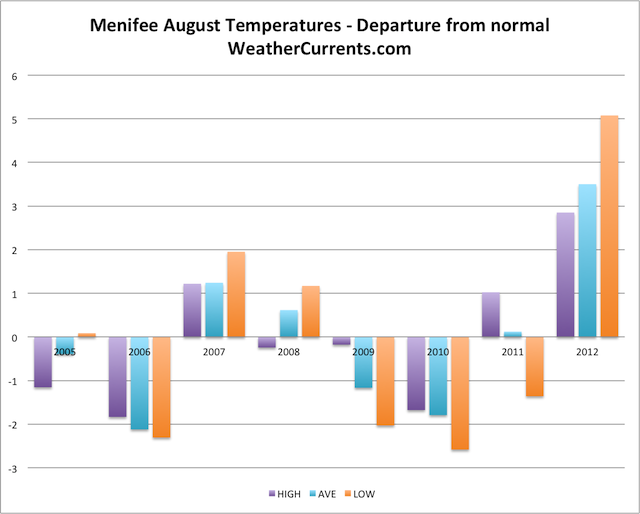 August temperatures in Menifee (records date back to 2005). © 2012 WeatherCurrents. 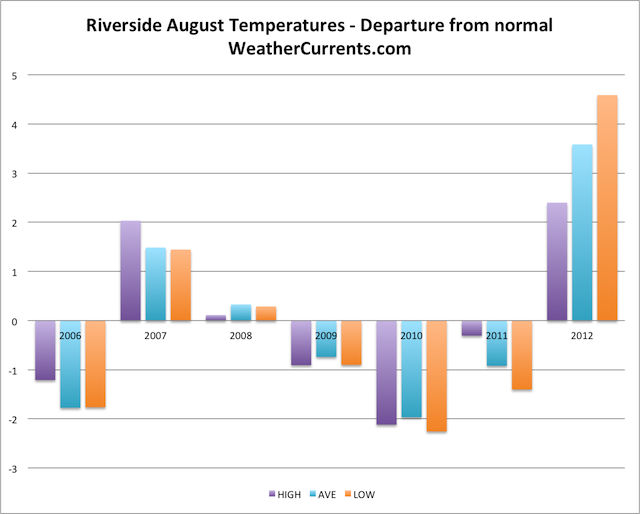 August temperatures in Riverside - Canyon Crest (records date back to 2006). © 2012 WeatherCurrents.